I wrote this before we moved this week, so this is actually my old fridge. Several bags full of individually wrapped two-person servings of ground beef—I buy my meat in bulk, especially since there’s just the two of us currently. Not only is it way cheaper, but you don’t have to worry about buying meat every week, which can be a big grocery bill downer. Eventually when we have a chest freezer, I’d like to buy a quarter or half of a cow, but until then I settle for rolls of beef. The servings are great because you just take out what you need, defrost it, and use…no worries about meat going bad! A bag of ground turkey, with individually wrapped servings as well—I bought some ground turkey a while ago when it was on sale, and use it to replace ground beef in certain recipes. One beef steak—Again, a bulk item that I bought on sale. Use it for all sorts or recipes, or just defrost and grill. A bag of chicken quarters—Bulk meat, again. Several bags of chicken breasts—I buy in bulk and individually wrap. Bag of white, flaky fish—Even better for fish tacos! BBQ Wings—Something I bought for Andy once. A bag of individually wrapped servings of refried beans—I made these ahead for the move, thinking I wouldn’t have a stove top. A bag of individually wrapped servings of Spanish Rice—For the move, again. Cubed chicken uncooked—For the move to put in the crockpot. Cubed cornbread—For the move, again for the crockpot. Cubed cooked potatoes—For the move, so I could make mashed potatoes. Cooked chili beans—For the move. Bag of biscuits—I make a batch and freeze the extras so they don’t go bad. Just take them out and defrost! Loaf of bread—I freeze extra bread to keep it from going bad. Pancakes—Even when I cut the batch in half, it always makes too many for Andy and I, so I reheat them later. Bags of frozen peas, corn, and okra—Every wife should have some frozen veggies on hand to make meals quicker and easier! Ginger root—It keeps so much better in the freezer! Garlic cloves—Again, they keep better this way. Containers of tomato sauce, spaghetti sauce, Rotel, and cream of chicken soup—Cans of these are not the right serving for two people, so I freeze the leftovers for next time. Bag of blueberries and blueberry freezer jam—Last week I went blueberry picking with my mother-in-law. Got a gallon for $10! They’re great for smoothies, eating, or treats! Tub of whipped topping—I never use this…don’t know why I have it! Half pint of vanilla ice cream—A splurge last week to go with a blueberry cobbler I made. 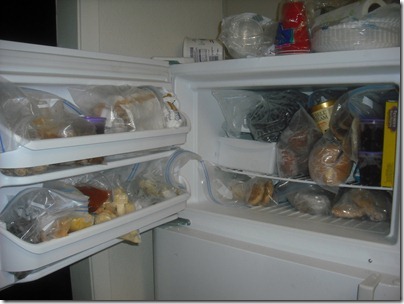 So there you have it…my freezer! Would you believe that all of that stuff fits in my tiny freezer?! I really don’t know how I would survive without it…it helps me save SO much money! What’s in your freezer? Do you use it to save money?